80x80cm photo light tent kit with 2x 50W 5400K daylight fluorescent bulbs. Comes with 4 different ‘infinity’ backgrounds: black, blue, red and white. Perfect for a large range of digital stills photography, ideal for catalogue photography, online auction photography, collectables and product photography. Enables you to create your own portable, self-contained, table top lighting studio. 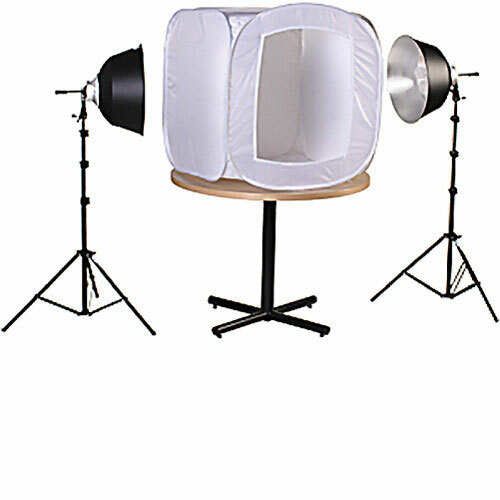 Light Tent Kit is available for rent or hire from RENTaCAM Sydney. Included:80x80cm photo light tent, 2x 50W 5400K daylight fluorescent bulbs, 4 different ‘infinity’ backgrounds: black, blue, red and white. Prices are in AU$ and inclusive of GST. If you find a better rental price elsewhere, let us know and when it comes to matching or beating it, we’ll see what we can do about it.